Welcome to The Riddler. Every week, I offer up a problem related to the things we hold dear around here: math, logic and probability. These problems, puzzles and riddles come from many top-notch puzzle folks around the world — including you! Recently, we started something new: Riddler Express problems. These are bite-size puzzles that don’t take as much fancy math or computational power to solve. For those of you in the slow-puzzle movement, worry not — we still feature our classic, more challenging Riddler. Before we get to the new puzzles, let’s reveal the winners of last week’s. Congratulations to 👏 Joseph Klarich 👏 of Vancouver, British Columbia, and 👏 Eric Lawrence 👏 of Sausalito, California, our respective Express and Classic winners. You can find solutions to the previous Riddlers at the bottom of this post. Something a little different this week: Two math-y word problems from Matt Reisman, a physics Ph.D. candidate at Washington University in St. Louis. Extra credit: What if you limit the hypothetical configurations to only those that are possible using the actual letter cubes included with the game? Here’s the solution to last week’s Riddler Express, which asked you to flip over lots and lots of coins — or at least to consider the mathematical implications of doing so. You start with 100 numbered, heads-up coins in a row. 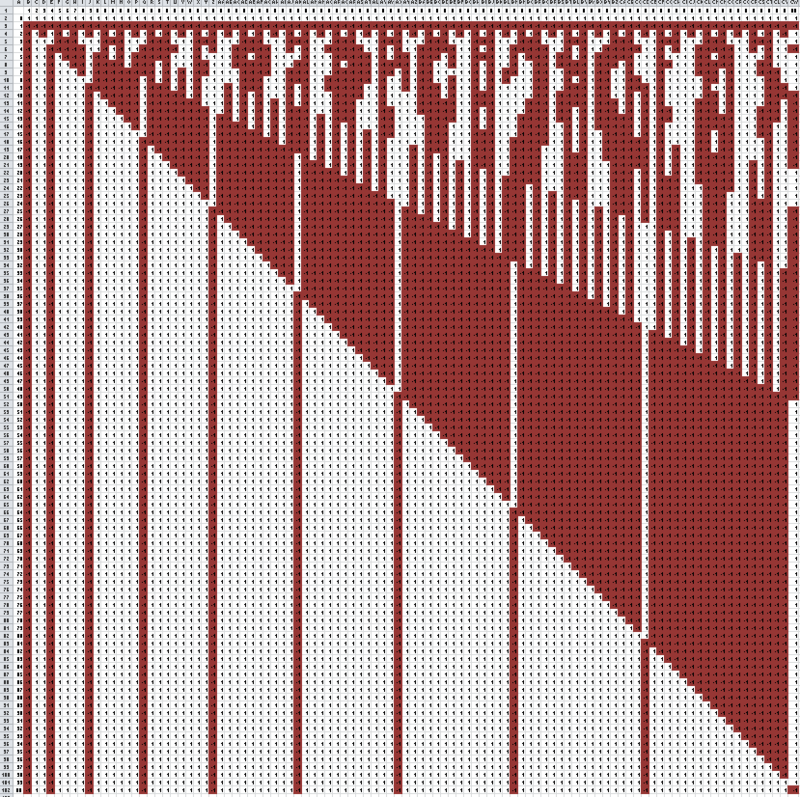 You then flip all those that are multiples of one (coins 1, 2, 3, 4, …) then multiples of two (2, 4, 6, 8, …) then multiples of three (3, 6, 9, 12, …) and so on until multiples of 100. When you’re done, the only coins that will be heads down are the perfect squares! That’s coins 1, 4, 9, 16, 25, 36, 49, 64, 81 and 100. This illustration from Mike Bultemeier shows which coins are heads down as you move downward through the flipping stages. (The heads down coins are red.) It’s gorgeous and I’d like it framed and hanging on my wall. And here’s the solution to last week’s Riddler Classic, concerning a deadly board game meting out justice in the Kingdom of Arbitraria. You place three coins along a 1,000-square track, and then move your token along that track according to the rolls of a die. If you land on any of your coins, your life is spared and the game is over. If you go past all three, you are executed. To give yourself the best shot at staying alive, place your coins on spaces 4, 5 and 6. You’ll survive about 79.4 percent of the time. A little intuition here goes a long way. For starters, you’ll definitely want to place a coin on square 6. It’s the best square because it maximizes the number of rolls that could land on it. You could roll a 6 and hit it in one shot, for example. If you don’t get there in your first roll, you’re guaranteed to have at least one more shot at landing there. Square 5 is another great candidate for the same reason. You could hit it on your first roll, of course, but if you roll something less than 5 you’ll get another chance to save your life on that square. You can confirm this intuition with math, of course. Once you’ve got your coins on squares 5 and 6, let’s say you’re struggling with whether to place your final coin on square 4 or on square 7. Here’s how you can decide, as calculated by Aaron Cote. For a total probability of about 0.794. For a total probability of about 0.758. So 4-5-6 is better. For a calculation of this result using the inclusion-exclusion principle, see the great post from Laurent Lessard. Also see these nifty deadly board game simulators from Ira Fay and Fritz. The length of the board is a bit of a red herring. The answer would be the same if the board were 100 or 1,000,000 squares long. As the chart below from Zach Wissner-Gross shows, after you pass the early part of the board, the odds of landing on any given square are roughly equal — about 2/7 — and it wouldn’t much matter where you placed your coins. If you’re making a play for martyrdom, placing the coins on 1, 2 and 7 minimizes your chances of survival. You’ll live just 47.5 percent of the time. If adjacent coins aren’t allowed, 6, 8 and 10 are your best bets to survive, and 1, 3 and 7 are best if you have a death wish. Important small print: To be eligible, I need to receive your correct answer before 11:59 p.m. EDT on Sunday. Have a great weekend!